In this post, we have summarized for you the drone laws in Tanzania. The import of drones is permitted in Tanzania. For the operation of drones of any kind, permission must be obtained from the aviation authority. Private users must complete the form TCAA/FRM/SR/OPS – 01 as long as the aircraft does not have more than 7 kilograms of take-off mass (Light RPAS). Regardless of the takeoff mass, however, all drone users must prove their qualifications. A list of organizations from which the certificates are recognized can be found below. Maximum altitude: The maximum height is 121 meters (400 feet). Maximum horizontal distance and FPV: Drone flights may only be performed within sight. Compulsory insurance: A drone insurance is mandatory for flights in Tanzania. For flights with Medium and Large RPAS, you need special permits from the Ministry of Defense. Distance to airports: International airports must be within 5 kilometers of each other. To airports of which only domestic flights take place, a distance of 3 kilometers must be observed. Other safety distances: Flights over populated areas and crowds are allowed only with the approval of local authorities and the CAA. No-fly zones: Flying over national parks is prohibited. Operating Hours: In Tanzania, drones are only allowed in daylight. Commercial pilot regulations: Commercial pilots must obtain a permit for drone flights from the CAA. Business activities include advertising, photography, and research. We have researched the listed drone regulations for Tanzania to the best of our knowledge. We cannot guarantee the correctness of the information. If you want to be on the safe side, contact the competent aviation authority. Alternatively, you can also ask the embassy in your country for further information about the regulations. Please leave us a comment when you receive news and/or gain experience with your copter in Tanzania! Dear all, do you have a contact in Tanzania who can help with getting a drone& film permit? Thank you! We would recommend drone users to rent a drone in the country you are travelling to and not bring your own. To fly your drone in Tanzania you need to get a permit from the Ministry of Defense, the Tanzania Civil Aviation Authority and a 3rd party insurance ($50). And if you are bringing a drone in Tanzania in its original packaging box, you might have to pay import duties and tax at the airport or port. So if it’s your personal drone, we would recommend you remove from box and use a shoulder bag to carry the drone. I will be in Tanzania end of June, would like to obtain a permit and insurance. Hello, any update on this? Is there any way to get a permit for national parks Serengeti or ngorongoro + Zanzibar. I am travelling for a wedding and need to take some drone footage. I have Mavic pro (small and light) . I would be interested in this as well. Did you find solution? Hello! Do you have any news regarding this? In Dubai, you need to purcahse a licence which is for $245 and its for lifetime no need to renew. 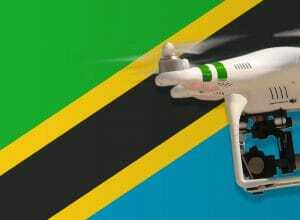 For Tanzania, you need to send a letter to TCAA and Ministry of Defence together with your drone serial number plus ID and a payment of $80 which has to be paid every year. Insurance is not a must, but it’s good to have incase an accident occurs as instead of paying a premium of the accident, the insurance company can cover it for u for just another $80. So it all depends, sometimes it may not be your fault but the device can go out of range and fall on a person or car and cause an accident, what will you do then. Can we apply for the permit before arriving in Tanzania? Is this an online application? Same question here! How can we apply before arrival? I’ve just submitted my request for Recreational use. Are you successful to get a permit? Had someone get it from Gudluck Nnko ? How much the permit would cost from him then ? I think your link leads to an outdated version of the document. The latest version is linked in my article. The article above the comments section on this page. I have been in Tanzania since the 30th of June, and leaving back home in the morning. I have a Phantom 4 Pro with me. Came throught customs without any problems, drone in backpack went through scanners. I carried a copy of my emails i sent the Tanzanian CAA with me just in case. No problems when i arrived. Not even a question to what it was. Had some amazing flights over the ocean here. Did you have a permit then? I m heading to Zanzibar and Tanzania from 13-23Aug and planning to fly my Mavic Air there. I have filled up the form but is there a email to apply online? And i have the drone insurance with DJI HK, is that working for the permit? Sorry for my late answer. How were things going? Hello, I’m also planning to go in Tanzania. Finally, did you take you drone for your trip? If yes, witch document/insurance did you have? And did you have any trouble? Thank you for the interesting article. I’m about to go to Zanzibar in late November and was wondering how to fill in the application for registration. I’m not sure what to fill in the point 9: “details of equipment fitted or to be carried” = what do they mean with this? I have a DJI Mavic Air. I think it’s asking whether you have other products fitted on the drone as extra as some professionals add a bunch of features on their drone such as thermal imaging to be able to ser animals at night as an example. Carrying other products together with the drone might mean, if you have other extra equipment that you will be carrying together example a GoPro or extra batteries etc. We are Aerial Mapping and Survey services provider for various projects. We have been operating in Tanzania since 2014. Feel free to contact us. I’ll be in Tanzania in late May 2019. At this time, I don’t have any certifications from any of these agencies. Will I have to see the civil aviation authority in Tanzania to get certified and where? I’ve been in Zanzibar (Tanzania) in the beginning of December. Early November I have tried to get all permits in order to get approval to fly my drone (Mavic Air) on the island. But I didn’t succeed. I sent all necessary documents to the TCAA and filled in the form (my drone is registered in Belgium, I have a belgian licence to fly my drone and I have the necessary insurance). First, my mail didn’t go through for a while, it appeared that the mailbox was full. When I finally sent my email, I had to wait for a while. Later on I received an answer from the TCAA telling me that my request was forwarded to 2 employees. I sent mails to those people and didn’t receive any answer. After having questioned the Tanzania Ambassy in Belgium, it appeared that there is a new rule (it has also been added to the website of the TCAA in between): Prior to register a drone, one has to request the approval of the Ministry of Devende and National Service. Since it was time to fly to Zanzibar, I decided not to take my drone on the island. I was very sad because the scenery there is just fantastic. Has anyone taken a drone into Tanzania without receiving approval from TCAA? I’m traveling around the world and cannot afford to leave the drone at home, in case I don’t get a response from TCAA. Very helpful post. But still did not understand if I have to got the approval from authorities upfront or at place. I am going to Zanzibar in 10 days and have to take my Mavic Air. But there are many contradictory views/comments and posts about this subject. I have read in two other blogs that they did not get any issues without getting any approval. Please, if someone have updated information or experience in the last month to update us too. My impression from the information on this page is that it is legal to import a drone into Tanzania, but actually flying it requires permits. And obtaining those permits is essentially impossible, because of Third World bureaucracy. So basically, only fly a drone in a fairly secluded or “chill” area where police are unlikely to harass you. Correct me if I’m wrong. Do you know if there is a rental place for drones in Zanzibar? I would like to rent a drone as long as i stay in vacation. I have leased 5000+ acres in tanzania for agri . want to do survey , contour mapping , watchdog function and later may be spreading of fertilisers and pesticides . i have very good contacts but no real knowledge of drones . your advice is sourly needed right from selection of drones . confident of getting licence .